I'm not one to set build. In fact I only have two complete base sets; both are of SP Authentic. However, collecting is also about experimenting. So I'm going to make it a goal to build a set. I didn't just make this decision while shuffling through cards bored. I saw a complete built base set on the shelf of my LCS listed at 30 bucks and thought: "Wow that would be a neat set to look through in a binder" and so I decided to go for it! But what fun is there in buying? If I can build this realistically attainable set on my own through trades etc. why not? The set you ask? Well for my friends in the US of A, it's called 2003-04 Pacific Atomic; otherwise known as the once annually released set held by McDonalds across Canada. 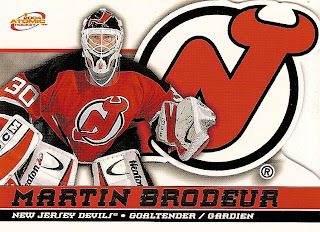 McDonalds released cards through Upper Deck starting in the early 90's and then switched to Pacific in the early 2000's only to switch back to UD for the 05-06 season. Unfortunately, McDonalds stopped this promotion and it's last release was in 2009-10. Ain't that a lovely crease for ya! Poor Giggy never saw it coming. The base set clocks in at 55 cards, which is smaller than I think every product that comes out these days. I have a head start owning 14 of the 55 base already. The set I'm building excludes the six rookie AUTO's (included in the base set technically). Those AUTO's book anywhere from $200-400 in top shape. 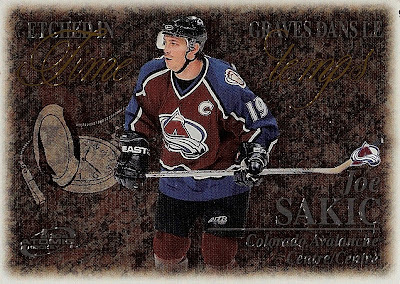 It also excludes the "McDonalds Pacific Patches," (Silver and Gold variations) again those ring from the lowest at $80 and highest $500. 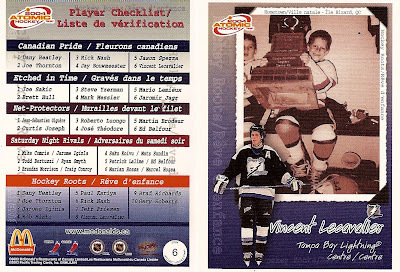 Hard to believe that a Mario Lemieux McDonald's patch card would go for 5 bills but that's what the book says. The most exciting part will be collecting all five insert sets. 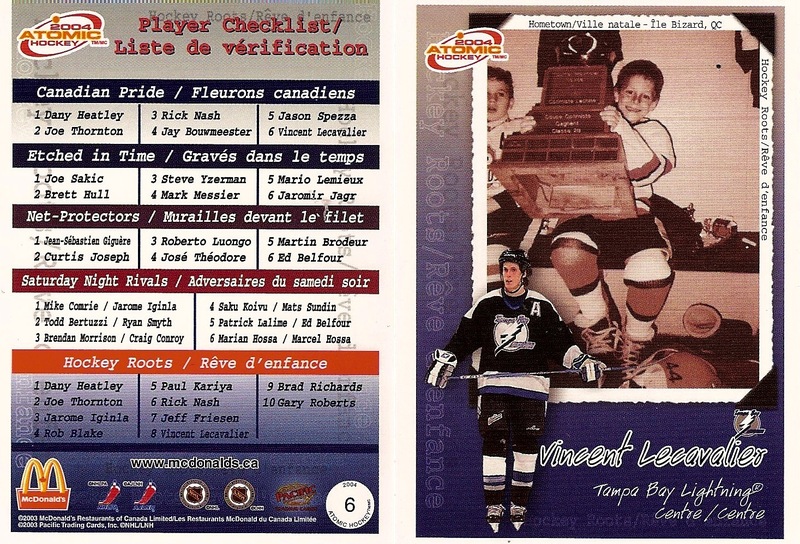 First are the ten checklist; all cards have a picture of the player on the card as a kid. I think that's a pretty neat checklist idea, I have almost half of these already with four of the ten cards. With a similar design to the base cards. 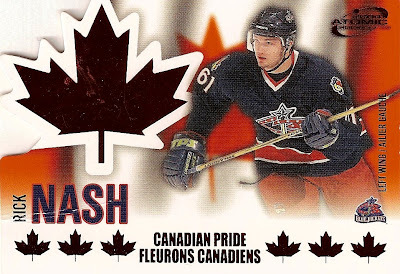 This insert said called "Canadian Pride" have a die-cut maple leaf on the left and showcase all Canadian players (obviously). It's a six card set and the only one I have is the one above of Rick Nash that quite obviously sustained some serious damage. These "Etched in Time" inserts have a really neat puzzle piece texture to it. They aren't the most eye catching cards but it's a unique idea. Again this is a six card set and I have only the card above. 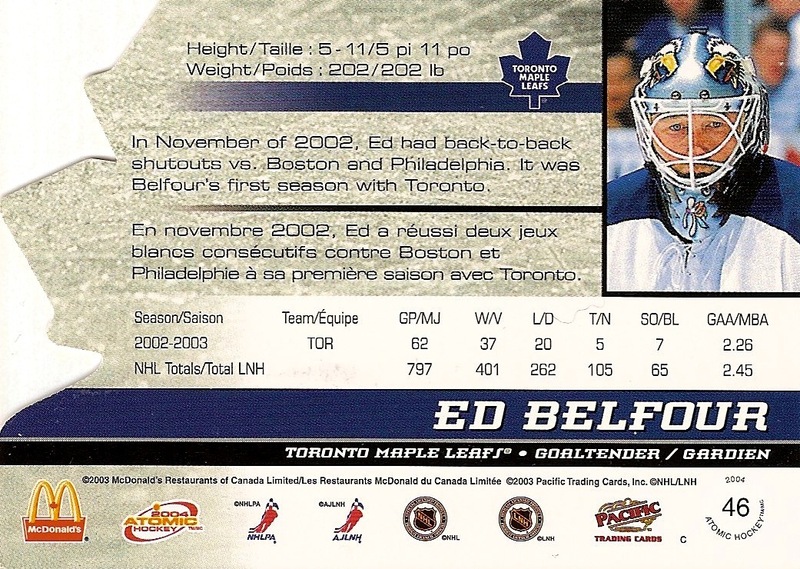 The Lalime/Belfour "Saturday Night Rivals" card is in rough shape but is my favourite insert set for sure! Such a sweet design, sweet name and just sweet overall! 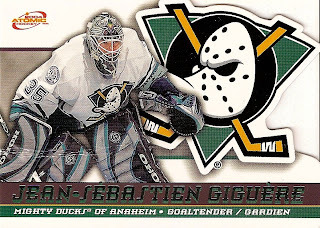 Once again, I have one out of the six cards in this set. 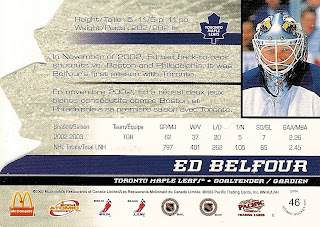 The last insert set called "Net Fusions" is a pretty cool all goalie set. 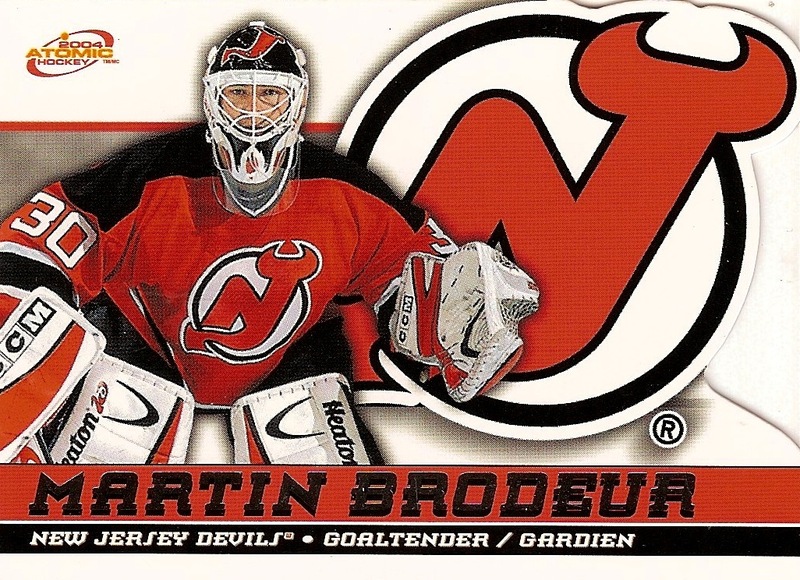 It has a mesh background that looks like a net behind the goalie. This time I don't have any of the six cards in the insert set. To wrap it up, I ask, if you have any of these laying around to contact me at johnny_canuck57(at)yahoo.com or drop me a comment below. 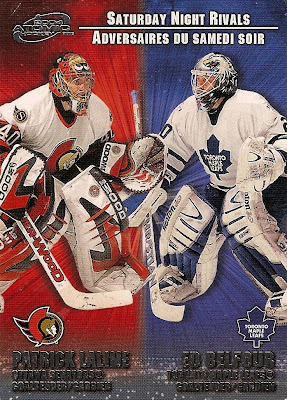 I'd be more than happy to work out a trade for these bad boys. Anyways if you are interested in trading let me know. INSERT IDEAS - 2012-13 Certified "Masked Marvels"
Collecting For Kicks. Awesome Inc. theme. Powered by Blogger.